This is a soup Iâ€™ve adapted over the years to help with any flu-like symptoms, stuffy noses, rainy days or cold nights. Notice this is not chicken noodle soup. You will find no noodles up in here. when youâ€™re fighting off infections, eliminating sugar and simple carbs will cut your down time in half. Infections feed off of sugar so eliminating it kills it! Look at that! Anyway, back to the soup. This chicken soup is so hearty you wonâ€™t miss the noodles. Plus, noodles get soggy after a few days and this soup is best on day three. Yes, day three. 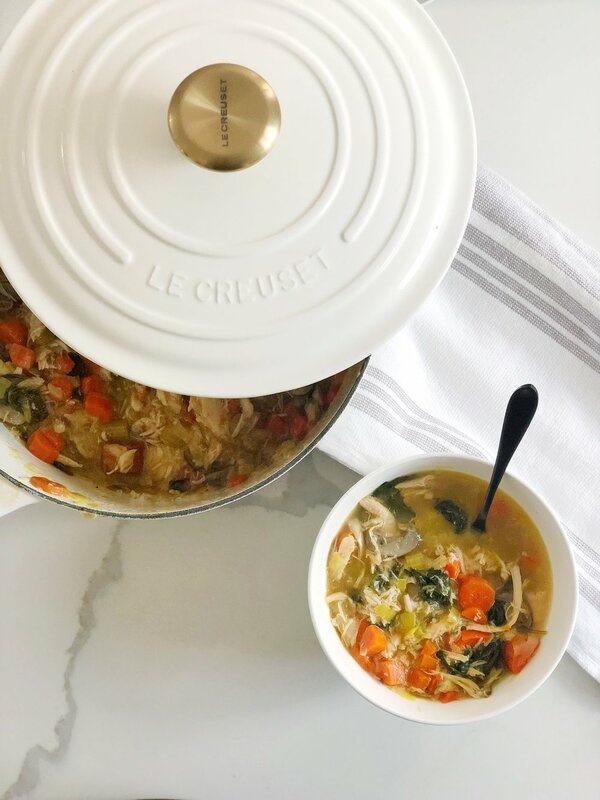 The biggest trick to making this soup from scratch in under an hour is buying a store bought rotisserie chicken. This cuts cooking time in half and the taste is spot on! This last time I made it I actually roasted my own chicken (I know, how very Ina Garten of me) but now I understand why Jeffery requests a roast chicken every Friday night because it is SO DAMN GOOD. And if you donâ€™t know who Jeffery is it might be time for you to binge watch some Barefoot Contessa. I donâ€™t think it makes much difference in the soup because itâ€™s no longer a roast chicken on its on, but if youâ€™ve got time and youâ€™re feeling fancy I say go for it! I add a little grated fresh parmigiano reggiano cheese on top and take my gluten on the side in the form of crunchy, crusty garlic bread if Iâ€™m not avoiding gluten/grains that day. Pro tip: prep and chop all your veggies. Use a garbage bowl to cut down on trips to the garbage and read the entire recipe all the way through before starting! AND without further adoâ€¦the recipe! Preheat the oven to 425 degrees. While preheating rinse chicken, remove giblets and pat dry with paper towel. Mix all ingredients in a bowl and stir to combine. Rub all over chicken and especially under skin. Once its all evenly coated top and bottom, drizzle what ever left over you have of the seasoning mixture into your baking dish (I used a cast iron pan) and place the chicken on top, breast side up. Once the oven is preheated, place the chicken on the center rack. Once the chicken is in, reduce the oven temperature to 375 degrees. The super hot oven helps the skin get crispy at first and then the lower temperature helps it cook evenly without burning. Leave in the oven for 20 minutes per pound or until it reaches and internal temperature of 165. And if you still donâ€™t have a meat thermometer (because I know you donâ€™t) go get yourself one stat! You will never have to guess if your meat is cooked ever again. If using a rotisserie chicken, de-skin the chicken and place in the botton of a dutch over or stock pot. Over medium heat, let the skin crisp up. Add a splash of apple cider vinegar to the bottom after it start to brown to de-galze the pan. Remove the skin then add a little olive oil and then add in garlic. Let the garlic cook for about two minutes and add the onion. Add a pinch of salt and pepper, stir and let cook for five minutes. Then add carrots and celery and continue to cook. Add another small pinch of salt and pepper for the carrots and celery and stir occasionally for 5-7 minutes. Once combined add in both boxes of stock. Bring to a boil stirring occasionally. Once boiling, drop the heat a bit and add in the sliced mushrooms. Break apart the chicken and add in the meat (and bones if still attached. weâ€™ll remove them later). Once all the chicken is added cook for another 10-15 minutes at least. You can let this cook for as long as youâ€™d like really. After 15 minutes, use tongs to remove the bones and/or skin. This is also a great time to go through and shred the chicken. Once the bones are removed and the chicken is somewhat shredded, add in kale. *If you bought it as a bunch just remove the stems and rough chop it before adding to the soup. If you bought prewashed in a bag slowly add it in batches. It will wilt down quickly so you can add more. With the kale added you can add in some fresh parsley if youâ€™d like and youâ€™re ready to serve! You will be eating this all week and it only gets better with time! Let me know how you like and it and tag me so I can see on Instagram! This soup will kick any cold and make you feel better instantly!